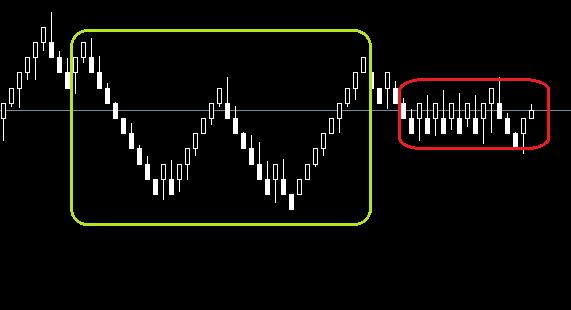 Constant Range Bars (CRB) is a type of candlestick charting method that does not draw a new candle every unit of time (like every 1/5/15/30 minutes), but every time the range (high-low) of the candlestick has reached a certain preset value (e.g. 8 pips in eur/usd). Meaning that all candles have the same range, but possibly wildly varying time duration: you can have 5 candles in a minute during a news announcement, or 1 candle lasting 6 hours during a quiet Asian trading session, both with the same high minus low range. This can possibly result in smoother, more persistent intra-day charts. If the range of the CRB is set at e.g. 8 pips for eur/usd, it can be seen that sometimes this CRB-chart will show you a nicely trending (up & down), persistent, smooth chart (the green rectangle in the image below). Sometimes however, the range of the candles will be "wrong", resulting in consecutive overlapping, noisy candle segments (the segment in the red rectangle in the image below). I would think you need to create a feed-back loop that measures certain things on a moving window, both on your input (tick-data chart or maybe M1 chart) and your output: the resulting range bar chart. The goal is to dynamically adjust the range variable of the candlesticks, to create the smoothest, most persistently trending "Dynamic Range Bar" chart. maybe some historical intra-day seasonality data: there is clear evidence of periodic intra-day volatility because of the nature of fx: different market centers open at different times: low vol in Asia, rising as the European banks & large funds open their desks, maximum during the overlap of the US-EU sessions, then declining as the dateline travels over the pacific, to pick back up as Wellington & Tokyo wake up. Efficiency indicator (the net change in the price movement over an n number of periods divided by the sum of the absolute values of all the bar-to-bar price changes over these same n-periods). If your goal was to maximize the smoothness / persistence of the new "Dynamic" Range Bar chart, what criterion could you use to dynamically adjust the range? Would the above elements be enough? And how would you combine them to reach the goal? Browse other questions tagged volatility fx local-volatility tick-data charts or ask your own question. Do intraday volume and volatility share the same properties? Which is best chart for intraday trading & how to use it? How to compute the realised intraday volatility? Why are some Yang Zhang constant k different from the original paper?